Well, hello cookie! 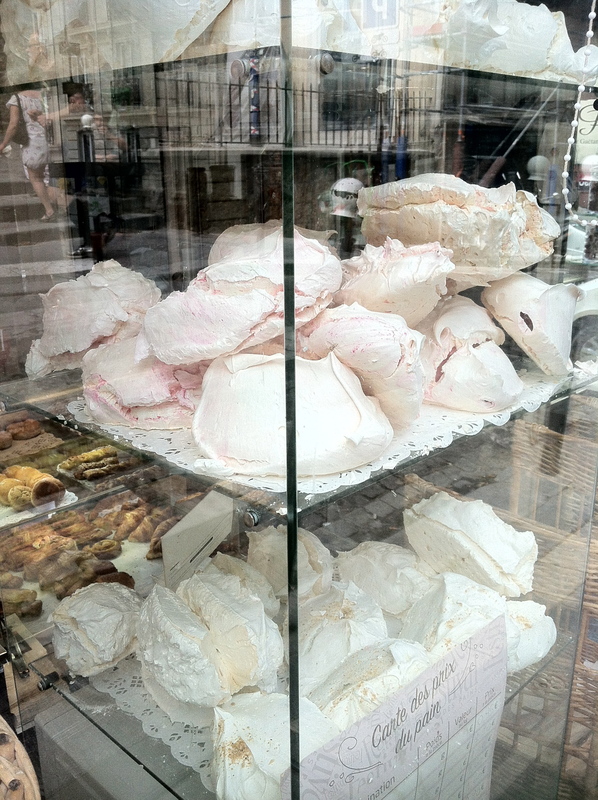 Which is what I said to these meringues after they hung out in my oven for 6 hours. That’s a long time, guys. And why I now respect people who make these naturally gluten-free sugar and egg white delights. 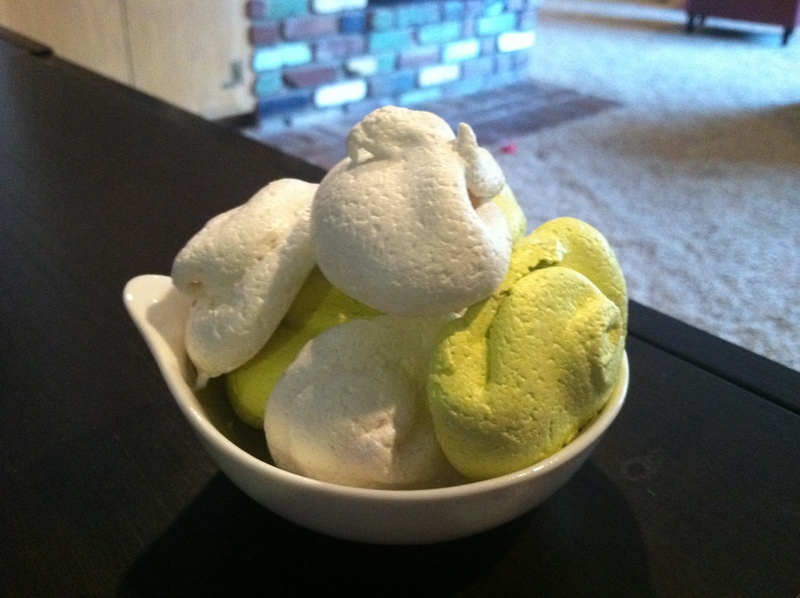 Because even though these are light, fluffy, delicious, and decorated appropriately for St. Patrick’s Day, or Easter if you want to throw in some other pastels, there are a few tricks here to make your gluten-free meringues much better. 1. Use super fine sugar, white sugar. I’m more of an ‘organic chunky’ kind of sugar haver, so that’s why my meringues do not look nearly as smooth as the ones you find in those French pâtisseries. 2. Be patient. Not my strong suit, especially when I was ready to bake a potato for dinner. Your oven has to warm up then stay closed for at least six hours. Plan accordingly. 3. Have fun. I did the green color in honor of the day I made them, but you can also add in chocolate chips, nuts, or a variety of colors. Here’s how to whip up this sugary gf cookie like you’re a Frenchie. Except those found in the Paris are like, as big as your head. See, like this. 1. Preheat oven to 350 degrees. Cover a cookie sheet with foil and set aside. 2. Beat egg whites until foamy with hand, or stand mixer. Gradually add sugar and beat until stiff peaks form. 3. Add vanilla, salt, and food coloring if using. Now is the time to separate the mixture if you’re going to do multiple colors. 4. Using a teaspoon, drop teaspoonfuls onto foil covered cookie sheet. Place in oven, and turn oven heat. Allow to sit in oven without opening the door for at least six hours. You can also let it sit overnight. Tags: gluten free dessert, gluten free junk food, gluten free recipe, gluten-free paris. Bookmark the permalink. That’s actually why I made them! My son loves those meringues from TJ’s and it was his birthday so I was trying to get him to o.d. on sugar out of guilt about the whole missing Disneyland thing. Just distract ’em with food! I like your thinking. Oh Lord. I’ve never baked with truvia, so I don’t even know what adjustments you have to make. I will, however, totally feel sorry for you. Totally.